Samurai Warriors 3 (SW3) was released for the Wii in North America on September 27, 2010 with a MSRP of $49.99. The game was developed by Omega Force, and published by Nintendo for its release in the United States and Europe. Samurai Warriors 3 received a "Teen" rating from the ESRB with "Mild Suggestive Themes, Use of Tobacco, Violence" listed as content for parents/gamers to be aware of. 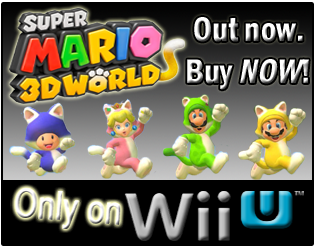 SW3 is classified by Nintendo as a "Tactical Action" game on its press page, and the game features a single-player campaign, local split-screen multi-player, as well as online multi-player for 1-2 players. How many hours have Wii owners spent hacking and slashing in Samurai Warriors 3 since it released last year? Let's take a look! 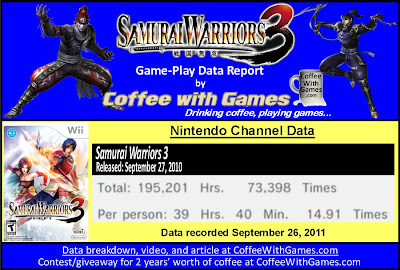 Samurai Warriors 3 has about 4,922 Wii owners that have reported game-play data through the Nintendo Channel for the United States of America, with 364 days possibly reported. SW3 has 195,201 Total Hours of game-play reported, with an average overall play-time of 39 Hours 40 Minutes "Per person" reporting data. The game's average play-time per session/day reported is 2 Hours 39 Minutes. Samurai Warriors 3's Amazon.com sale rank is #5,818, and it is currently selling for $23.68 fulfilled by Amazon. The game's "professional" review score average is 58.73%, based on 15 reviews on GameRankings.com. SW3 has a 4.5 out of 5 Stars rating on Amazon.com, based on 7 customer reviews. The game's customer review score average is 88.57%, when the reviews are converted to a 100% review scale. While researching for this post, I googled "Samurai terms coffee" and was very surprised by the first result that popped up. Apparently, not only do samurai drink coffee, but they have their very own coffee company! It's the Country Samurai Coffee Company, based out of Hawaii. If you are actually wondering how the company came up with its name, you can read that HERE. Now, you may be thinking, "Coffee, why a data report on Samurai Warriors 3?" Well, it was not one of the games I have been tracking on a weekly basis, and I didn't even see it when looking at older Wii games to do reports on recently. No, the reason is really simple. A reader from GoNintendo.com left a comment on my SpongeBob post from yesterday that was posted over on GoNintendo earlier today, saying he wished he could see the data on Samurai Warriors 3 and another Wii game. When I saw his comment, it reminded me I had completely forgotten to track Samurai Warriors 3 last year after it released, so I decided to record the data and get the report together. While SW3's "Total Hours" reported are not very high, I think the hours reported "Per person" show the Wii owners that played this game really enjoyed it and they have put a lot of time into it. Also, I found the difference in the "professional" review score average and the Amazon.com customer reviews to be interesting, and I wonder if it was because the "professional" reviewers didn't put a lot of time into the game? I don't know. If you have played Samurai Warriors 3, what do you think about the game? Is it a game you would recommend to other Wii owners that haven't given it a chance, and were perhaps turned off by the "professional" review scores for the game? Also, if you have played all of the games from the Samurai Warriors series, which game from the series is your favorite? I am a massive, massive fan of Samurai Warriors 3. It's actually the first Warriors game that I played, and because I found I loved the formula so much, I've since gone and bought 12 more Warriors games on PS3, PSP and 3DS. My own play data far outdoes the average play time - I'm actually at 120 hours. It's by a very long way my most played Wii game. I absolutely hate the way the western media handles these games. They clearly don't actually play the games at all - I remember a classic Gamespot moment where the reviewer of this game scored it ridiculously low, but copied a massive paragraph on the Chinese Three Kingdoms wikipedia entry and stuck it in his text. Even if "Samurai" wasn't a giveaway, virtually the first thing you see when you play this game is a massive map of Japan. It seems clear to me that the western press doesn’t get that a big part of the appeal of these games is the historical context. They decry the games as button mashers (they’re not), but don’t seem to understand that what’s fun is participating in massive, important historical battles with exaggerated, but real people from history. Yes it’s over the top, but it’s historically accurate enough to get people into Japanese history. I reviewed the game for PCWorld back when it was released, and scored it 4.5/5. I cannot enthuse enough about it. One other note: the Warriors games score very well in Japan in magazines like Famitsu. 8, 9 and 10 across the board usually. It makes the western press look even more silly that they can’t even try to understand the appeal behind these games. I've had a few people recommending this game, and a few like it to me, I just haven't had a chance yet (seems I have a bit of a backlog) - but I agree with the sentiment you posted here, about how sometimes the 'professional reviewers' seem a bit narrow-minded about the games they play, which is one of the reasons I love reading blogs and reviews in other places as well. A lot of times these sites like IGN or Gamespot hit it on the head, and obviously it's an opinion piece, but sometimes the people reviewing the game are just not good 'fits' for that type of game, and I think that the reviews suffer as a result. "Professional" reviewers always rate the Warriors games fairly low due to their repetitive nature. Of course they have no problem giving the newest FPS that all feel the same a 8-10. Sports games also gets a "pass", even though most of them aren't more than just roster updates...especially on Wii, since most of them aren't much more than rehashes of what's been available on PS2 since 2007, some with no online play. I'm still hoping that Nintendo brings over the next Samurai Warriors game to the west. "I absolutely hate the way the western media handles these games." I feel that with no "standard" of any sorts for reviewers to follow, and editors picking/allowing guys that seemingly approach games with bad attitudes/or non-preference, the "handling" of these type of games won't improve. Considering you have 120 hours in the game, I think shows how much time players can put into it, and it may not be a game to be reviewed after playing it two days on a weekend. The "not good 'fits'" is a big area, as I was commenting to GamesAndBiz. If a reviewer has a history, of being irrational, way out of the loop, or won't answer simple questions about a "review" they wrote...I think that person should find a new hobby, but when you have sites allowing poorly written reviews, with clear bias, the issue then is two fold...the reviewers, and the EICs allowing the garbage to be posted. Yea, while I personally enjoy the FPS genre, I don't understand how one game can get a 2 out of 10...then the next can get a 10 out of 10. Almost all have the same elements, FIRST PERSON SHOOTING, just with a few tweaks here and there...whether control tweaks, weapons, or even upgrades. Some FPS games, usually the lower budget titles, often get slapped with the "this is generic" in reviews...while they do EXACTLY what the other "big budget" FPS games do...I really don't see much of a difference...even after playing the Battlefield 3 beta last night. I would say Madden gets a pass for sure, and I stated on Chalgyr's review for the new Madden that I haven't purchased a new football game since EA purchased the exclusive rights to the NFL contract which was back in 2004! 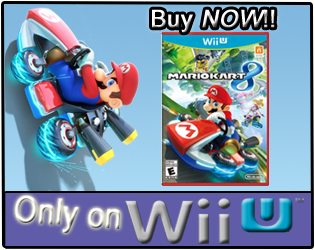 A roster update should not cost me $60 every 12 months, when the game-play is remaining nearly the exact same...though I guess we could say the same with even Mario games(2D and Kart) that use the same formulas over and over, yet usually get reviewed well overall...perhaps only because of the name "Mario" in the titles.